In September of 2013, the Swedish daily newspaper Dagens Nyheter could reveal that the police authority in Skåne, southern Sweden, had kept a register of roughly 4,700 Roma individuals or people with close connections to Roma. There was a clear consensus that the register was illegal. But no one raised the issue that the register was based on ethnicity, which is why Civil Rights Defenders and eleven Roma, including three children, sued the Swedish government for violations of their human rights. On 28 April 2017, the historic judgment was handed down – Svea Court of Appeal held it to be a case of ethnic discrimination. Almost four years after news broke of the Skåne police authority’s register, the legal process was over. By then, Civil Rights Defenders, who represented the eleven individuals, had fought for justice in both the district court and the court of appeal. The verdict was significant. Especially for the victims whose rights had been violated and for other Roma, but also for society at large. Strategically, it was important to show the existence of ethnic discrimination in Swedish society, including in public institutions. But let’s look back. The Roma are, and have always been, a particularly vulnerable group in Sweden, as in other European countries. Xenophobia and discrimination are part of everyday life for Roma, and many live completely or partly outside of society. Yet, Dagens Nyheter’s revelation about the register still came as a shock to many Roma. It also marked the start of a journey that would serve up yet another severe blow to the confidence in Swedish society and the judiciary. Imagine finding out that you are listed on one of the police authority’s registers. Not because you, or someone in your family, ever did something wrong or committed a crime. You are listed simply because you happen to belong to a certain ethnicity. You also find your children, only a few years old, listed on the police register. What is more, the register includes both people who are dead and people who have not lived in Sweden for many years. Why? you might ask. That is what the Roma did – without getting a response. It was established early on by courts at several instances that the register was illegal. The Chancellor of Justice decided that everyone on the register would receive SEK 5,000 as compensation for the violation of their rights. However, no one wanted to acknowledge that the register had an ethnic dimension, and no reasonable explanation was offered as to why the register had been drawn up in the first place. For the Roma, this was the crucial question. So it was for Civil Rights Defenders as an organisation that works for human rights in Sweden and the rest of the world. After engaging in a dialogue with some of the people who had been victimised, we filed a joint lawsuit against the state in March of 2015. 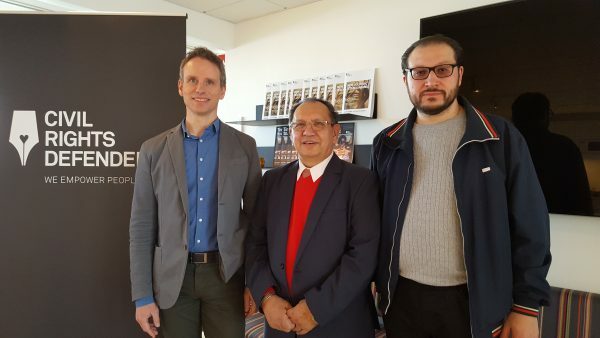 The case was litigated at first instance during the spring of 2016, and Civil Rights Defenders and the eleven plaintiffs won against the state in the Stockholm District Court in June of the same year. The judgment concluded that the eleven persons in the case had been registered solely because of their ethnicity, in violation of both the Swedish Police Data Act and the European Convention on Human Rights. The verdict also made reference to the abuse that Roma have historically been subjected to by the Swedish state. The district court imposed a compensation of SEK 30,000 to each of the persons concerned in the case. But before the judgment could gain legal force, the Chancellor of Justice appealed, citing other reasons for why the register had been created. This meant a new judicial proceeding in the spring of 2017, this time in the Svea Court of Appeal. Fortunately, the court of appeal upheld the district court’s verdict, and the case was closed in May 2017. Shortly after, the state, through the actions of the Chancellor of Justice, decided to pay the full damages of SEK 30,000 to all of the nearly 4,700 Roma who had been registered – the largest total sum the state has ever paid out in damages. A process of this magnitude is very expensive and complex, and the question is whether the Roma who were subjected to the violation would have had the resources to pursue the case on their own. The collaboration between the eleven victimised Roma and Civil Rights Defenders was a prerequisite for success. For Civil Rights Defenders, as for other organisations, this type of process is an important working tool. To take on a legal case as an organisation in order to shine the light on a larger issue and achieve wider social change is called strategic litigation. In this case, Civil Rights Defenders not only wanted to achieve redress for the eleven whom we represented or the others who had been registered. We also wanted to highlight the issue of discrimination against a minority and the Swedish state’s violation of human rights. It was a task of responsibility, not least because much was at stake, both for the Roma and for other groups in society that face discrimination. The verdict meant that it was established, in black and white, that the register was illegal and that the police uses ethnic profiling. Now, we must make sure that it does not happen again. The police will need to review and change internal processes and working methods, and work with their value system to bring about a change in attitude. Even though justice has been done, the work is far from finished. In the light of the police authority’s register, Civil Rights Defenders has, together with the Department of Criminology at Stockholm University, produced the report “Randomly Selected”. The report, which was published in December 2017, is based on interviews with both police officers and people who have been subjected to ethnic profiling. The aim of the report is to offer a deeper understanding of ethnic discrimination within the police force in Sweden. John Stauffer, Legal Director of Civil Rights Defenders, Fred Taikon and Adam Szoppe – two of the persons who were registered by the Police.